By simply buying larger package sizes of NanoWorld AFM probes, you automatically get a built-in quantity discount compared to the smallest packaging size. A package of 10 pcs. costs 1399 USD. NanoWorld Pointprobe® NCL probes are designed for non-contact or tapping mode imaging and offer an alternative to our high frequency non-contact type NCH. The NCL type is recommended if the feedback loop of the microscope does not accept high frequencies or if the detection system needs a minimum cantilever length (> 125 µm). This probe combines high operation stability with outstanding sensitivity. Compared to the high frequency non-contact type NCH the maximum scanning speed is slightly reduced. All SPM and AFM probes of the Pointprobe® series are made from monolithic silicon which is highly doped to dissipate static charge. They are chemically inert and offer a high mechanical Q-factor for high sensitivity. The tip is shaped like a polygon based pyramid. For applications that require hard contact between tip and sample this probe offers a real diamond tip-side coating. This coating features extremely high wear resistance due to the unsurpassed hardness of diamond. The typical macroscopic tip radius of curvature lies in the range between 100 and 200 nm. Nanoroughnesses in the 10 nm regime improve the resolution on flat surfaces. The CDT features a conductive diamond coating. 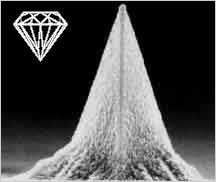 Some typical applications for this tip are Tunneling AFM (Conducting AFM) and Scanning Capacitance Microscopy (SCM). For applications allowing higher resonance frequencies or a shorter cantilever length use NanoWorld Pointprobe type CDT-NCHR. 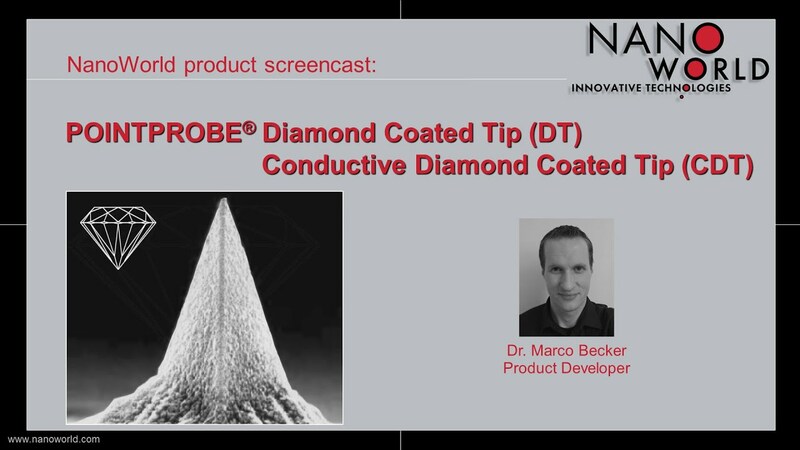 The conductive diamond coating consists of a 100 nm thick polycrystalline diamond layer deposited on the tip side of the cantilever resulting in an unsurpassed hardness of the tip. The coating is highly doped with boron which leads to a macroscopic resistivity of 0.003 - 0.005 Ohm•cm. The aluminum reflex coating deposited on the detector side of the cantilever enhances the reflectance of the laser beam and prevents light from interfering within the cantilever.